Facebook Privacy and Identity Theft: Is your face being used in an ad? We recently covered the dangers of sharing too much information on Facebook, but what happens when Facebook shares too much about you? You may have noticed the new, targeted ads appearing in your Live Feed. 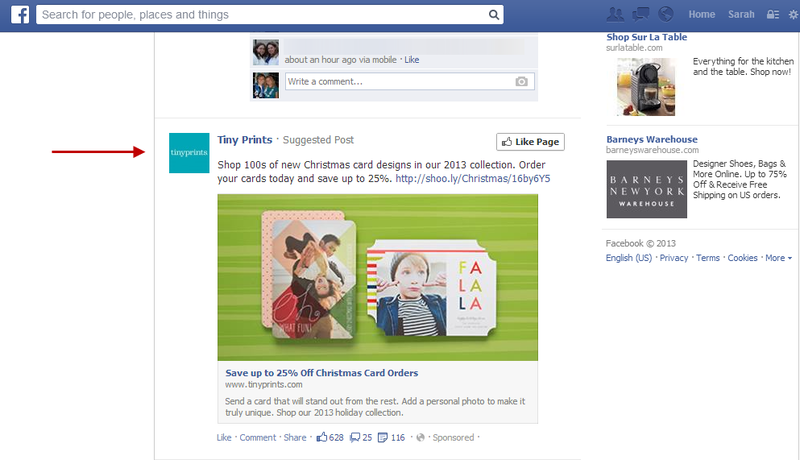 For example, I recently performed a search for personalized Christmas card services. An hour later, an ad for Tiny Prints popped up in my Feed. You may not mind these ads; you may even like them. That said, how would you feel if Facebook began posting ads that used your personal information? Unfortunately, it’s already happening. Social Ads represent Facebook’s latest marketing endeavor. Translation: If you install an external app or “Like” a page, Facebook may publish your actions in your friends’ Feeds. For example, my aunt Mary recently Liked her cell phone provider’s page. Later, an ad for the same provider appeared in my Feed along with Mary’s photo. The point, of course, is to recommend the brand to me in a personal way. If your aunt Mary likes this service, you will too. I’ll confess, I have seen and disregarded these ads. After all, who cares which cell phone provider my aunt Mary uses, right? While this marketing ploy may seem benign, there are real dangers surrounding their tactics. Identity thieves thrive on information and Social Ads provide it, whether you realize it or not. If you aren’t convinced, consider the following scenarios. They will help you gain a new perspective. Let’s delve further into aunt Mary’s situation. After Liking her cell phone provider’s page, an add pops up in her friend David’s Feed. David is a Facebook friend, but Mary does not know him personally. He is an acquaintance of a family member who added Mary as a friend several months ago. Unfortunately, David makes his living by applying for and maxing out credit cards in other people’s names. Seeing Mary as a target, David takes the first steps to gather her information. Hello, my name is Michael and I’m calling on behalf of my mother, Mary Brixton. She has moved several times in the past year and I’m afraid that she has forgotten to pay some of her bills. Would you mind telling me which address you have on file for her? I want to make sure her account is up-to-date. The customer service representative hesitates, but David convinces her that his mother is elderly and needs his help. He provides the city Mary lives in, her spouse’s name, and her children’s names (all collected through social media). After some coaxing, David is rewarded with Mary’s address. He also asks for the last four digits of her Social Security Number “to ensure that there aren’t any identity mix-ups.” In 15 minutes, David has gained enough information to steal Mary’s identity. Got my new Nordstrom card today! So excited to shop for x-mas!!!! Stella is a friend of Katie’s from chemistry class. After seeing a Nordstrom ad with Katie’s picture attached, she reads her status update and becomes angry. Katie has everything. Why should she be the one who gets to spend? Motivated by jealousy, Stella texts Katie and casually invites her to lunch. When Katie goes to the ladies room, Stella rifles through her purse and steals the Nordstrom card. By the following week, Stella has charged more than $3,000 to Katie’s account. As you can see, it doesn’t take much to incite identity theft, especially when you are unaware of the motives of others. Sharing information through ads may seem harmless, but the risks they pose outweigh the benefits of sharing “Likes” with your friends. 1. Visit your Facebook page and click the gear icon in the upper right-hand corner. 2. Scroll through the menu and select Privacy Settings. 3. Select the Ads item in the menu of the left-hand side of the screen. It’s your choice to share information on Facebook, but you can’t always choose how others use it. Be wary of sharing too much and keep tabs on how your info is shared automatically. Your identity is a powerful commodity—be sure to protect it.